Something pretty amazing" is the way Samford University's McWhorter School of Pharmacy chair of the Department of Pharmacy Practice Michael D. Hogue describes a 20-year relationship between the school and its counterpart at Meijo University in Nagoya, Japan. Representatives of the two pharmacy schools met at Samford Thursday, July 10, to celebrate two decades of what all agree has been a highly successful exchange program. The initial idea, said Hogue, was for graduate level clinical pharmacy students at Mejio to visit Samford for a summer program that would introduce them to American clinical pharmacy practices and academics. "It is what we envisioned it to be," said Joseph O. Dean, who was the MSOP pharmacy dean when the relationship was begun in 1994. At the time, the Samford pharmacy school was eager to broaden its international connections and welcomed Meijo as its first partner from a non-English speaking nation, Dean recalled. The relationship was formalized in 1997 with a signing ceremony attended by then Samford president Thomas E. Corts, Dean and Meijo representatives. "The relationship has been wonderful for both sides," Dean said, adding that a large part of its success boils down to people caring about each other "and caring about having strong pharmacy education in both countries." Since the first cohort of 9 Meijo students arrived in Birmingham in August, 1994, Samford has welcomed between 10 and 16 students for two weeks each summer for clinical training on campus and at area hospitals and retail pharmacies. They have attended professional pharmacy association meetings, enjoyed social outings and visited area cultural and historic sites. "The exception was the one year when there was an influenza outbreak," said Hogue. Through the years, Meijo pharmacists have also participated in lengthier Samford programs lasting several months. The learning exchange works both ways. About 10 Samford pharmacy faculty have traveled to Nagoya and other cities in Japan to participate in conferences of pharmacy educators, lecture in classrooms and absorb Japanese culture. Samford pharmacy students have studied at Meijo, where they made case presentations and gain clinical experience at local hospitals. The 20th anniversary observance included remarks by Meijo pharmacy dean Hirokazu Okamoto and professor Hiroyuki Kamei. Okamoto gave an overview of his pharmacy school, which enrolls 1,600 students and celebrated its 60th anniversary this year. He received congratulatory applause when he mentioned that its 2012 graduating class achieved a 100 percent passing rate on the national pharmacy examination and claimed a 100 percent employment rate. Kamei, making his 14th visit to Samford, praised the longtime exchange of faculty and students, citing their collaboration on research projects and other benefits. "It is important to learn the role of the advanced pharmacist in the U.S. and to learn how pharmacy education will contribute in the future. Meijo students gain valuable experience learning clinical skills and being with professional pharmacists during their visits to Samford," said Kamei, who detailed Meijo's clinical practice program that Samford students participate in during their visits. Samford and Meijo representatives exchanged gifts and mementoes during the ceremony. 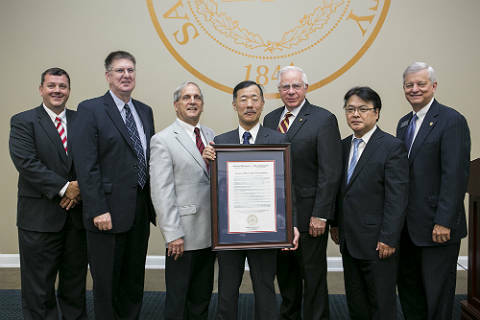 Samford vice president for advancement Randall Pittman, on behalf of Samford president Andrew Westmoreland, presented Okamoto with a framed proclamation commemorating the 20-year relationship. Okamoto left for Westmoreland a handsome enameled picture depicting Japan's famous Mt. Fuji and three cranes, which are symbols of good fortune in Japan. The Japanese delegation also received gifts of Alabama-made items to help them remember this year's special visit to Samford. For more stories like this, follow us on Twitter, Facebook, and see interprofessional education in action on Instagram.